Ferry from Koh Lipe to Langkawi is one of the popular ferry services in the southern region of Andaman Sea. 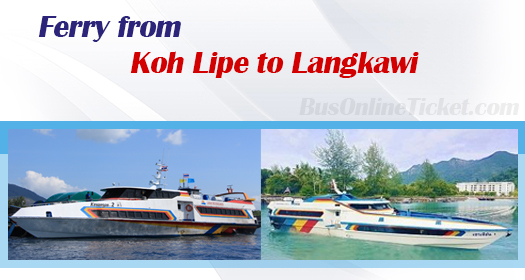 Because Langkawi is the closest port to Koh Lipe, many prefer to take ferry from Koh Lipe to Langkawi. At BusOnlineTicket.com, there are two popular ferry services available for online booking to travel from Koh Lipe to Langkawi. Bundhaya Speed Boat service is a ferry operator that has been in the industry since 2008. Meanwhile, Telaga Terminal has been in the business since 2005. Thus, both ferry operators are very experienced and have good reputations among customers. Ferry from Koh Lipe to Langkawi takes around 1 hour and 30 minutes to reach its destination. The ticket price for ferry from Koh Lipe to Langkawi is from RM 110.00 to RM 128.00. You can buy the tickets over the counter but booking in advance online reduces the chances of the tickets being sold out especially during high season. There are 4 ferry trips daily from Koh Lipe to Langkawi by Bundhaya Speed Boat and Telaga Terminal. The pickup point for ferry from Koh Lipe to Langkawi is at Pattaya Beach. Please note that you will first have to board a long-tail boat and transfer to ferry later. The long-tail boat service cost 50 baht. For Telaga Terminal, the ticket price for the ferry includes the ferry tail-service fee. On the other hand, there are two drop off points in Langkawi. Bundhaya Speed Boat will drop off passengers in Kuah Jetty, while Telaga Terminal will drop off passengers in Telaga Harbour International Terminal. The Thailand immigration office in Koh Lipe is at Pattaya Beach, next to the Bundhaya Resort. Pattaya Beach is also known as Bundhaya Beach. It is the same location as the ferry pick up point. In Langkawi, the immigration office is available in both Kuah Jetty and Telaga Harbour International Terminal. To give time for the check-in, customs and immigration process, please arrive at the departure point early at least 1.5 hours before the departure time.